Chevron Packing will be highly suitable for all your applications related from heavy duty to medium duty. In robust conditions, it can help you bear low as well as high pressure. Chevron packing seals are combination of header ring, v ring and gland ring. In chevron packing, the center ring can retain high and low pressure because of its flexibility. This center ring may be known to you as main ring. Headers are made of phenolic resin, acetal resin, nylon, fabric rubber and reinforced rubber due to there hardness. Radial slots are provided on the top of the surface which helps in paying the pressure directly onto the lips of the adjacent rings. V seals are made of high grade rubber which is laminated synthetic fabric. It facilitates you an automatic sealing action on the lip. Rubberized fabrics are used in V rings that are used in Chevron packing. Using V seals in your chevron packing does not require any pre-axial load. Gland ring is also an essential part of chevron packing. Seal material are prevented from extrusion during the clearance gap during high pressure because of the laminated fabric synthetic rubber used in in manufacturing these rings. These ring used in your chevron pack have some properties like they are designed to tolerate temperature ranging from -30 to +130 ℃ specifically in oil. Use of these type of materials helps in adopting variety of extreme conditions. Where can be chevron packing be used? Generally these can be used in large earth moving equipments, hydraulic cranes, plunger pumps and in many other the applications. These packing have been found appropriate in robust conditions like in replacements of parts in old plants. 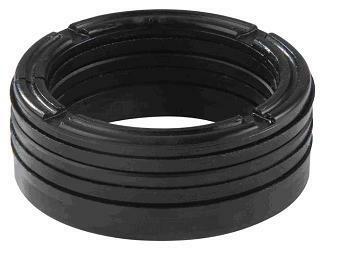 Chevron packing or 'V' packing combines same type of rubber, the rings in-between provide very impressive sealing. The system is so factory-made that it can grip prevailing pressure occurrences like shock loading, axial movements, oscillations and still loading etc.